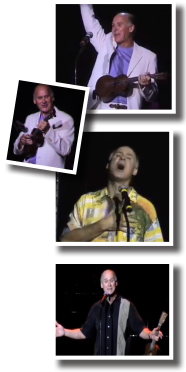 This one-man, self-contained show fills any venue with laughter, uplifting stories and songs. David features a special blend of clean comedy and a whimsical musical style that is perfect for any event including conventions, corporate meetings or community groups. His energetic and engaging stage presence immediately invites audiences to feel right at home. Born in New York State, David began his professional career at an early age in local radio and television. Following that, he became a success on the college circuit and moved on to serve in the US Army as an entertainment specialist in the Army’s Special Services. Today, as a seasoned veteran who has performed around the world to domestic and international audiences, David’s diverse and unpredictable style has received standing ovations from Russia to the Great Wall of China. His performances literally connect with everyone, everywhere as he reveals his gift for making people laugh. David also has a passion for coffee and has become well-known as a coffee roaster and coffee connoisseur. He and his wife, Suzanne, are also the owners of the famous “Senoia Coffee & Café” in Senoia, GA. The Café is most recently known for its starring role as the “Woodbury Coffee House” and downtown Senoia as the town of “Woodbury” on the hit TV show, “The Walking Dead”. David’s variety of freshly roasted coffee is sold online and at the Café. David Pengelly has shared the stage with Kenny Rogers, John Denver, Jimmy Buffett and the Beach Boys.